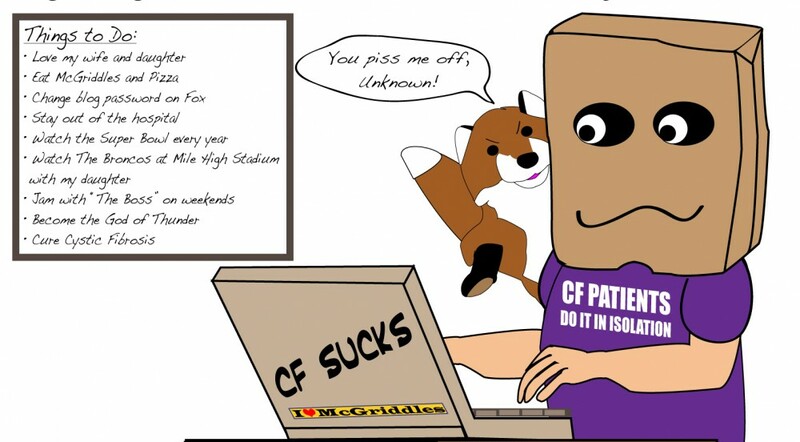 This entry was posted in cystic fibrosis, Health care and tagged cystic fibrosis, Health care by unknowncystic. Bookmark the permalink. I hope my opinions on Twitter didn’t offend you. Like you, I can see both sides of the story. My biggest fear is that the new, great changes won’t last for long and we’ll be back to the old system. As a CFer, I hope there isn’t some tragic disclosure of personal health information that ruins my chances of the happy, peaceful situation I have now. Additionally, I worry about changes in quality of care with the new healthcare bill. It seems like it may be opening Pandora’s box. If everything was exactly the way it is now, but with no limitations for preexisting conditions, no lifetime caps, and an affordable market to buy private insurance, that would be fabulous. I just don’t trust that changes will be limited to that, nor that the cost of it all won’t be something that eats into my chances at a comfortable, well-funded future. There is an element of letdown with the prospect that my careful career-planning and hard work studying and taking care of my health might be pointless because I could get all the perks without the effort. It’s the same problem I have with government bailouts for people who make bad choices. First, thanks for the comment. I’m writing this blog for myself and a record for my daughter to read one day. However, it’s nice to have visitors and comments. You in no way offended me. I actually enjoy and respect your candid, frank opinion. I agree that you’ve worked hard in your life to get in the position you’re in. I’m really torn on the bill. As someone with CF, I worry about maintaining insurance. If it comes down to losing it and having to choose between losing my family’s savings of 10 years and living, well . . . I guess that’s the flip side of what I potentially like about the bill – Insurance companies can’t turn me down because of something I was born with and had no control over. I don’t want free insurance; I just want the chance to buy it. I share some of your concerns about the bill and the future of the bill. I also agree with you about bailouts, which I think are one of the most hypocritical things we do as a country. Do we have a free market or not? Clearly, we don’t. I’ll share my other concern with you about the health care bill – what incentive is there for people to take care of themselves? With car insurance, I would have to pay more if I drive recklessly and get in accidents. Once people who don’t take care of their health, such as smokers, have to pay more, then we’ll see a change in the health of this country and health care costs will go down.